Marilao, officially the Municipality of Marilao, (Tagalog: Bayan ng Marilao), is a 1st class municipality in the province of Bulacan, Philippines. According to the 2015 census, it has a population of 221,965 people. With the continuous expansion of Metro Manila, the municipality is part of Manila's built-up area which reaches San Ildefonso on its northernmost part. Marilao is 22 kilometres (14 mi) from Manila and 23 kilometres (14 mi) from Malolos City. Marilao is one of the 21 Philippine municipalities, informally called "League of 21", that have met the requirements for cityhood set by the Constitution and Local Government Code of the Republic of the Philippines and as agreed upon by the League of Cities of the Philippines (LCP). Long before the establishment as an independent town, Marilao traces its origin as little as a barrio. It was initially a barrio of its neighboring town Meycauayan and the Franciscan missionaries from Meycauayan built a visita (chapel) dedicated to Saint Michael the Archangel. In April 21, 1796, the Barrio of Marilao was established as a pueblo as approved by the Alcalde Mayor of Bulacan and the Franciscan friars of Meycauayan, with the approval of Archbishop of Manila, the visita of San Miguel Arcangel became a town church where Padre Vicente de Talavera served as its parish priest. In 1913, Marilao completely became an independent town. Marilao is politically subdivided into 16 barangays, all classified as urban. In the 2015 census, the population of Marilao, Bulacan, was 221,965 people, with a density of 6,600 inhabitants per square kilometre or 17,000 inhabitants per square mile. The Pambayang Dalubhasaan ng Marilao Municipal College of Marilao is a public college in Marilao. The public primary and secondary schools in Marilao are governed by the Department of Education-Provincial Schools Division of Bulacan. Several private schools in Marilao also provide education services. It was elevated to the status of National Shrine by Archbishop Orlando Quevedo of the Catholic Bishops Conference of the Philippines. The first mass was held at the site on February 2, 1992, the Feast of the Presentation. Located in Brgy. Santa Rosa I. The Parish celebrates its patronal feasts on May 8 and September 29. Its 28th Parish Priest, Rev. Fr. Alberto D.J. Santiago succeeded Fr. Avelino G. Santos. Under Parochial Vicar, Fr. Francis Protacio S. Cortez III,OSA. It is hundred years old spiritual edifice in Poblacion I considered as “place marker” and serve as “point of orientation” to the local residents and visitors. St Michael the Archangel Parish is under the jurisdiction of the Latin Rite Diocese of Malolos, a suffragan of the Archdiocese of Manila canonically erected in 1961. The mother church of the Diocese is the Malolos Cathedral located in Malolos City, Bulacan. Located in Brgy. Loma de Gato. There are also a presence of other religions in Marilao like the Iglesia ni Cristo,Jehova's Witnesses, Born Again Christians, Members of Church of Gode International and etc. ^ "Province: Bulacan". PSGC Interactive. Quezon City, Philippines: Philippine Statistics Authority. Retrieved 12 November 2016. ^ a b c d e Census of Population (2015). 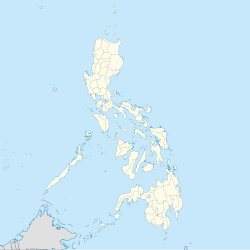 "Region III (Central Luzon)". Total Population by Province, City, Municipality and Barangay. PSA. Retrieved 20 June 2016. ^ "Bulacan, Philippines: Marilao, Bulacan: General Info". Bulacan.gov.ph. Retrieved 2016-12-07. ^ "Province of Bulacan". Municipality Population Data. Local Water Utilities Administration Research Division. Retrieved 17 December 2016. Wikimedia Commons has media related to Marilao, Bulacan.